I’ll never forget the first Thanksgiving dinner I ever hosted for my family. I cooked and cleaned for days. And, it turned out to be the best Turkey dinner ever or since. Even though I’ve recreated some of the same recipes, for some reason, they don’t taste as good as they did that triumphal day. I’ll also never forget the soup that I made after that first Thanksgiving dinner. It was one of the worst I’d ever tasted. Thank goodness I’ve learned a little about soup making since then. What was second nature to our grandmothers, making soup from the rest of a larger meal, is a lost art. And for some odd notion, we think that you can just throw a bunch of things into a pot and have it come out delicious. Not gonna happen, my friend. Shortly after that fateful Turkey Soup, I read through A Feast of Soups by Jacqueline Heriteau. While a little outdated in terms of ingredients readily available, this book is a soup maker’s handbook, explaining the basics to making a good soup. Now, my method has changed a bit since those days. Once the turkey dinner is over, I carve the rest of the meat, separating “sandwich” slices from bits of turkey that can be used in casseroles or other recipes that call for chopped turkey or chicken. I usually put any bones and non-meat parts of the turkey in my crockpot and let it simmer overnight. In the morning, I strain it and cool it. Once the broth or stock has cooled, the fat rises to the top and is easier to remove. Discard. 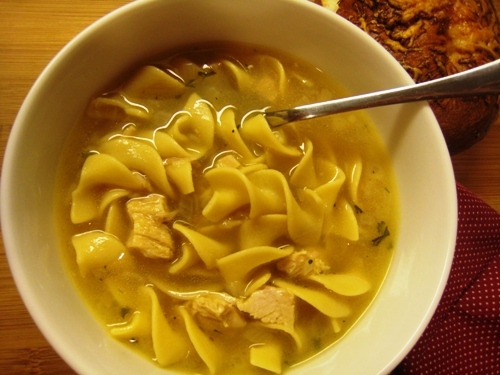 I use this general recipe for chicken, or in this case turkey, noodle soup. It’s pretty basic. Start with butter or oil, saute onion and carrots if you want. Stir in the broth. Bring to a simmer. Stir in the noodles and meat. Cook until noodles are tender. It’s easy. It’s delicious. And it’s a good way for us to make good use of every bit of that turkey. I love meals that stretch into more than one. Do YOU make turkey soup after Turkey Day? Hey Jessica! I’m excited to see your soup recipe, but the link doesn’t seem to be working…that’s sad. Hope you guys had a great Thanksgiving! We call it Turkey Carcass Soup (appeals to the boys), and here’s what we do. 1. Turkey carcass cook in a big pot with some onion, parsley, garlic. (I really like your crockpot idea. 2. Strain, pick off meat, etc. Then add some rice and two cans of tomato soup. 3. I’m not much of a canned soup kind of gal, but this is the exception, and it is really good. On Thanksgiving Day as I was cleaning up the kitchen (with the help of my grown kids) I tossed the carcass in the cp with veggies and herbs and my stock is ready to be defatted and made into turkey veggie soup. I’ll toss in any veggies that are in the fridge/pantry and add the option of people adding some small cooked pasta if they want (I don’t add it directly to the soup as it can turn mushy). Some nice crusty bread and that’s what we’re having for dinner tonight. I just made my first batch of turkey stock ever (first stock batch of any kind, actually). 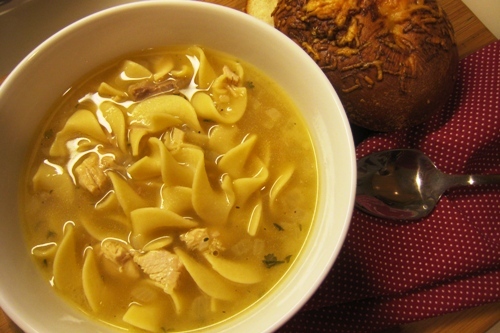 I’m excited to use it tomorrow to make your Turkey Noodle Soup recipe. My first batch of soup way back when didn’t turn out too well either. Now that I’ve learned, it’s SO much better! Yours looks delicious! Thanks!